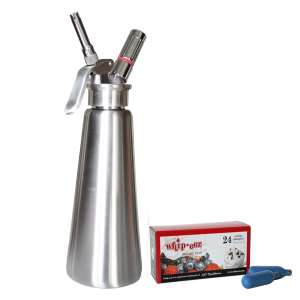 This professional cream whipper has an aluminum body and a solid high impact composite head. 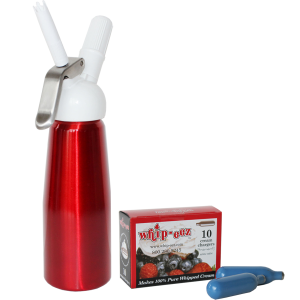 · Takes 1 standard N2o chargers when using 2 cups of whipping cream. · Included are three (3) decorating tips, metal base and a charger holder. 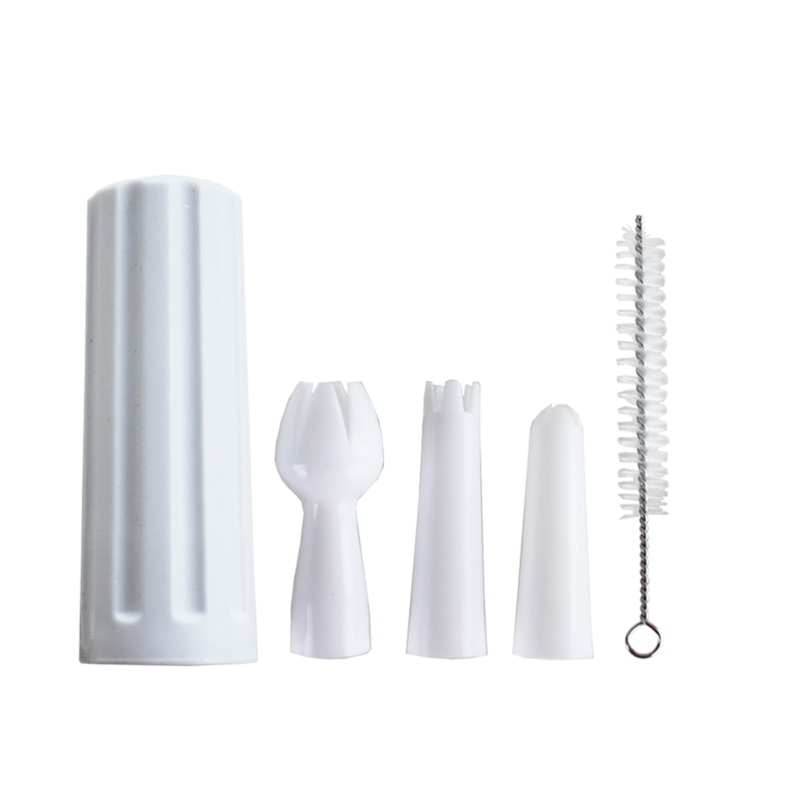 · Total height of this dispenser is 10 5/8″ NOT including decorating tip. · They will keep the contents fresh up to two weeks if kept in the refrigerator. 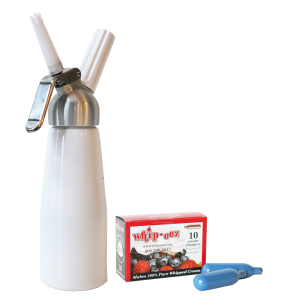 Whip-eez brand whipped cream dispensers reflect over 60 years of manufacturing expertise. 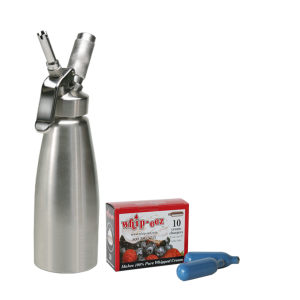 These whipped cream siphons are the perfect kitchen tools to whip up creams, flavored toppings and mousses. 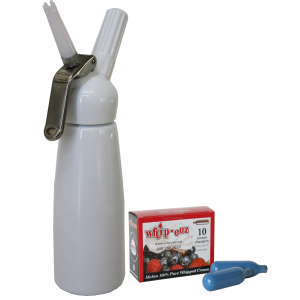 The Cream Whipper will withstand intense in home and restaurant use. 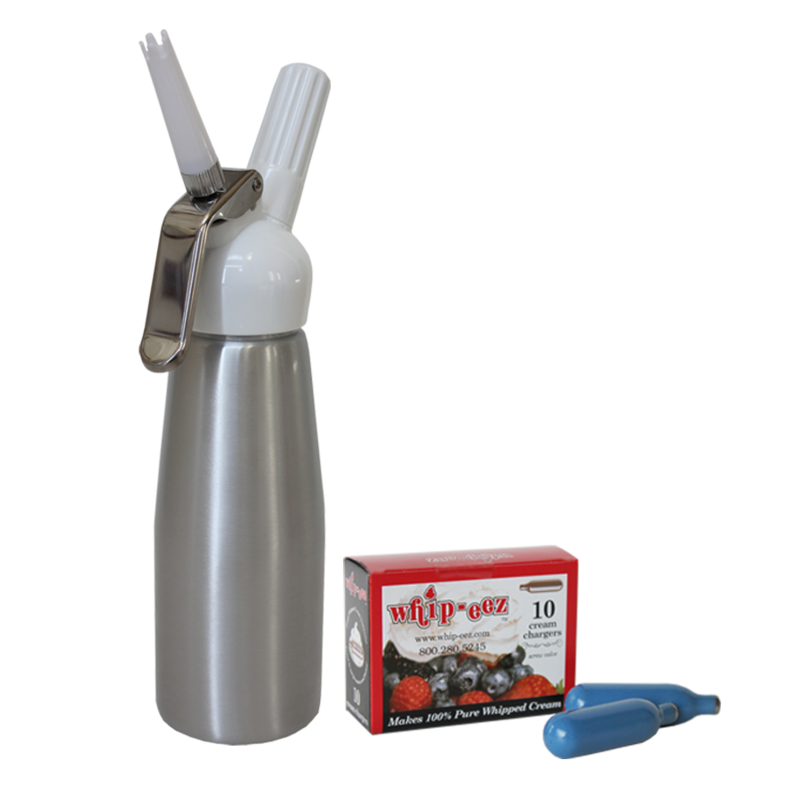 A decorator tip is connected to the whipper head with a metal adapter, allowing the decorator tips to be conveniently removed for cleaning while the whipper is under pressure. 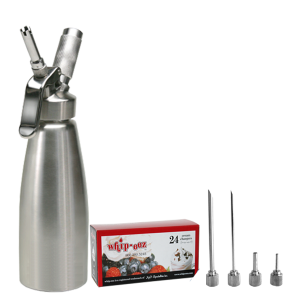 This whipped cream siphon is equipped with a specially designed strong and durable steel lever system allowing perfect dispensing and decorating. 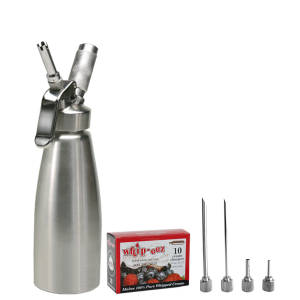 See our recipies for outstanding ways to use this Restaurant Quality Dispenser! Anyone who cooks must have this whipper. The whole process takes about 2 minutes and is way better than Reddi-whip in a can. 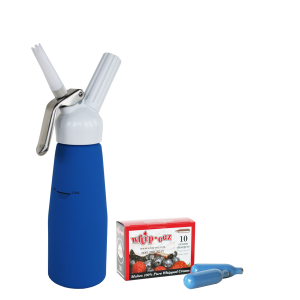 This 1/2 liter size is perfect for the home. A really nice design and a great price. Mine works great. Very happy. Very happy with whipper. Works every time. Great deal. Just like the pictures on the website, it looks and works great. 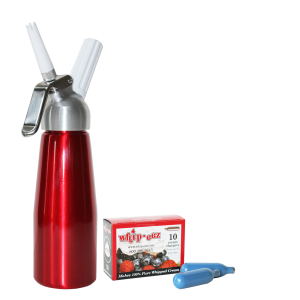 I am happy I chose to purchase my cream whipper here. My first time using it, I forgot to put in the rubber gasket (what a mess). I learn quickly and the second time was a charm. I would like to post here that this cream shooter is the real deal and the chargers that come with it work like magic. Don’t let the “hand wash only” tag scare you. It is so easy to hand wash. I filled my sink half way with warm soapy water and the cream just melts away. The parts and bottle look new after every wash. The idea of just putting in a few ingredients and making fresh whipped cream is what got my attention in the first place. If you ever read the ingredients in the cans you buy from the supermarket, you will probably want one of these too.